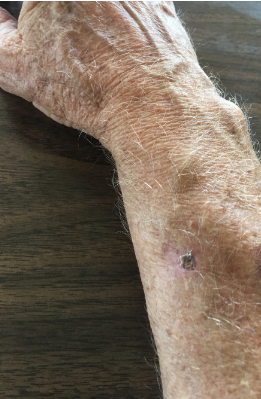 74-year-old man presents with 3-month history of painful lesion of the right forearm. 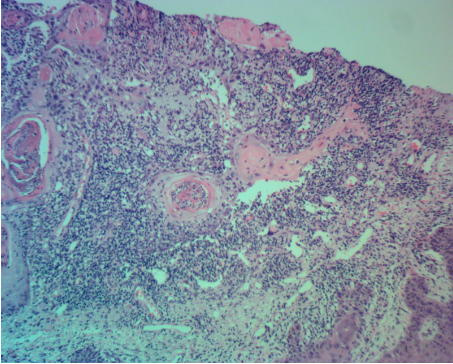 Biopsy found cystic squamous cell carcinoma with deep margins involved. Wide local excision was performed achieving clear margins. Fig. 1. Biopsy site of the carcinoma. Cystic degeneration within squamous cell carcinoma of the skin is not considered an especially malignant finding. These histologic findings may represent changes of carcinoma growth outstripping its blood supply. It can also represent changes occurring in keratoacanthomas. Fig. 2. Cystic space within the squamous cell carcinoma of skin. Second histomicrograph shows squamous cell carcinoma of the skin. Fig. 3. Cystic changes in SCC of the skin.